Despite being banned for in-crop use this summer in Arkansas, dicamba is a suspect in damage to thousands of acres of soybeans and to vegetables, backyard gardens and trees, writes Stephen Steed for ArkansasOnline.com. 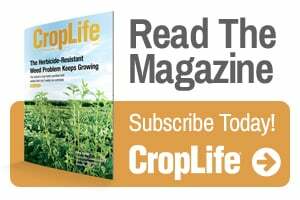 Farmers and regulators in other soybean-producing states that have allowed dicamba, even with some restrictions, have reported similar damage this year, a repeat from a year ago. On Thursday, two regulators with EPA visited state-funded research fields in Mississippi County hit for the second-consecutive year by dicamba. Use of the herbicide on crops has been banned in the state since April 16. The inspectors’ visit, which also took them to other farms in Arkansas, Tennessee and Missouri this week, was part of the agency’s work in deciding whether to re-register dicamba formulations produced by Monsanto, BASF and DowDupont. The current two-year registration for those products expires Nov. 9, and the EPA has said it expects to make a decision in August or September. EPA representatives are conducting similar tours in other states. The state Plant Board, a division of the Arkansas Agriculture Department, had received 176 dicamba complaints as of Friday, compared with about 750 this time last year. The board also has received complaints of 2,4-D damage to cotton. Read the full report on ArkansasOnline.com.